Do you feel you can’t get yourself started in the morning till you’ve had your cup(s) of coffee? You’re not alone, to be sure! But have you wondered why so? Is it caffeine that gives the kick or it’s rather a psychological trick? Probably both! Many of us could make our body more active and ready for action just by drinking a cup of water. I am taking a wild guess here and I think many of you are smiling only at the thought of replacing coffee with water. But what if for the sake of your health you would be forced to banish coffee from your life or at least cut down your daily ration? I bet you would feel at a loss how to do this! Don’t worry, alternatives do exist. Our dear plants are here to save us once again! Allow me introduce you to the “coffee of the poor” – Dandelion root. It was suggestively called the coffee of the poor because the less wealthy people never had access to coffee beans. Growing at every corner of the street, Dandelion has become the official substitute in some cultures, just like green tea is the energy booster and coffee replacement for many Chinese. The concept of a food of the poor reminded me of how in the past poor people would eat brown bread because it was cheaper, while rich people would eat white bread, which was more expensive and some think tastier but, as we all know – much less nutritious. Growing up in a farm, we would eat only the pulp of potatoes and feed the peel to animals. How ironic! I could go on and on with other similar examples but my lesson here is that sometimes we have to use common sense above all. And Dandelion root, once the coffee of the poor, is really a precious gift for everybody. Let’s see why! If I were to pick one single herb to detoxify and build the health of the liver, Dandelion would be my first choice. There is nothing more amazing than using our daily cup of dandelion coffee to get us going and help get rid of the toxins accumulated in our body at the same time. This brings the concept of having of cup of – let’s call it “dandelionee” – to a different level. Forget coffee! Let’s just have a cup of dandelionee! Still not convinced? I have a question for you then. Would you like your skin to look healthier and younger? I am taking a second wild guess and bet your answer is yes. Dandelion is your hero again, as it is a blood purifier. To understand what has this to do with your skin we need to look at the Chinese medicine wisdom. Dandelion root has cold properties and as many of the skin problems have been observed to show a hot nature in many of the patterns shown in patients, it can beautifully do its job. And again, by virtue of its detoxifying qualities, dandelion can easily affect the skin. This is a fact that both Western and Chinese Herbology agree upon. Want to add a few coffee beans to dandelion? Why not! If you just want to lower the dosage of coffee beans and not necessarily cut it out, you could combine the two. Besides, there are on the market herbal coffees already combined with different flavors, such as vanilla, hazelnut, etc. So why not combine all of these, have very little coffee beans added or even none, and have as a result a heavenly coffee. I know you are now ready for your cup of “dandelionee”. All you need is roasted dandelion roots. Just use the root as you would use the coffee beans, be creative and adjust the dosage per your taste. However, be cautious and consult a health care provider if you have ever had any biliary ailments. Dandelion can definitely teach us a lesson or two. 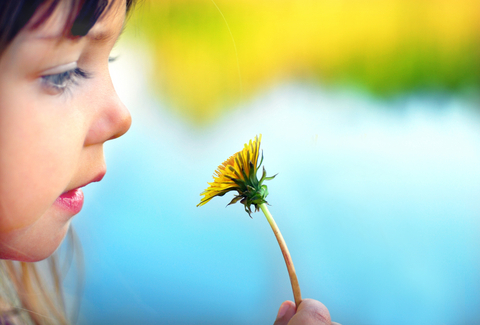 Amazing therapeutical effects, gives us a big hand in the morning, and let’s not forget that blowing on dandelion’s parachute-like tuft of hair is the favorite game of many children. Enjoy it and let health come back into your life!